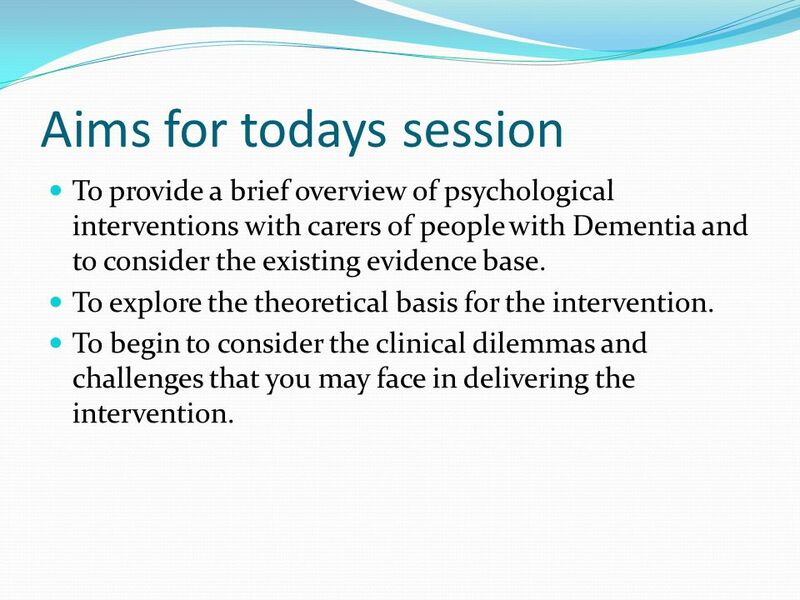 To provide a brief overview of psychological interventions with carers of people with Dementia and to consider the existing evidence base. 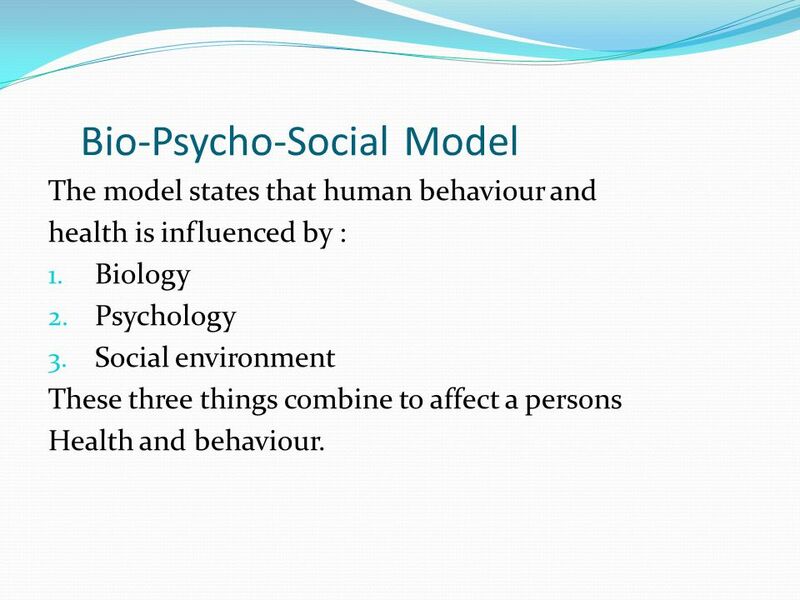 To explore the theoretical basis for the intervention. 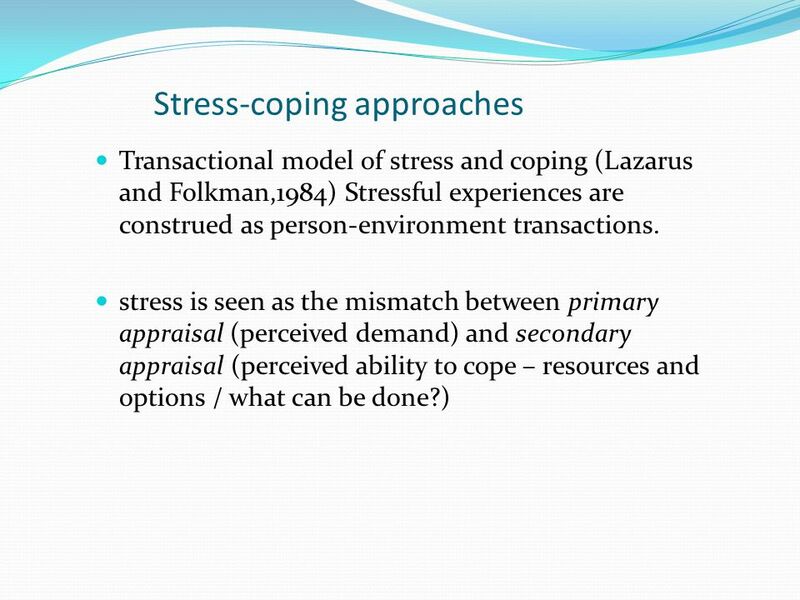 To begin to consider the clinical dilemmas and challenges that you may face in delivering the intervention. 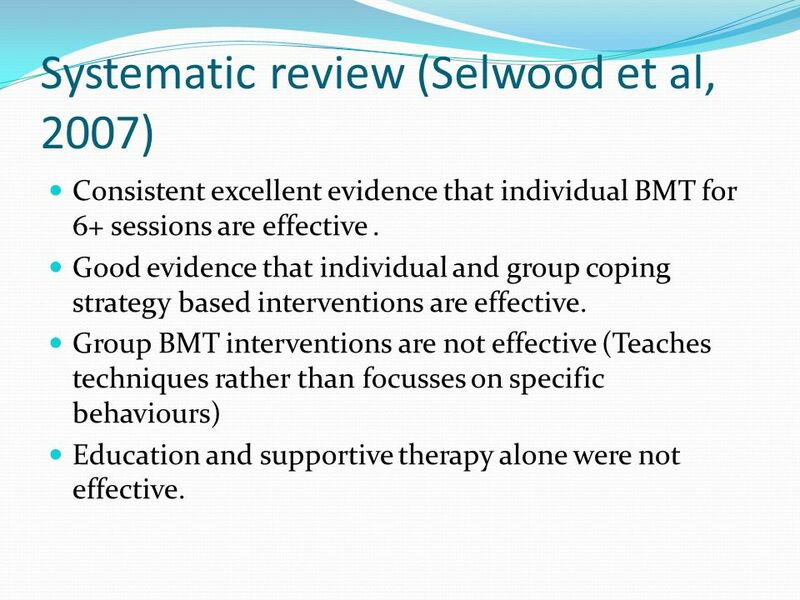 Consistent excellent evidence that individual BMT for 6+ sessions are effective . 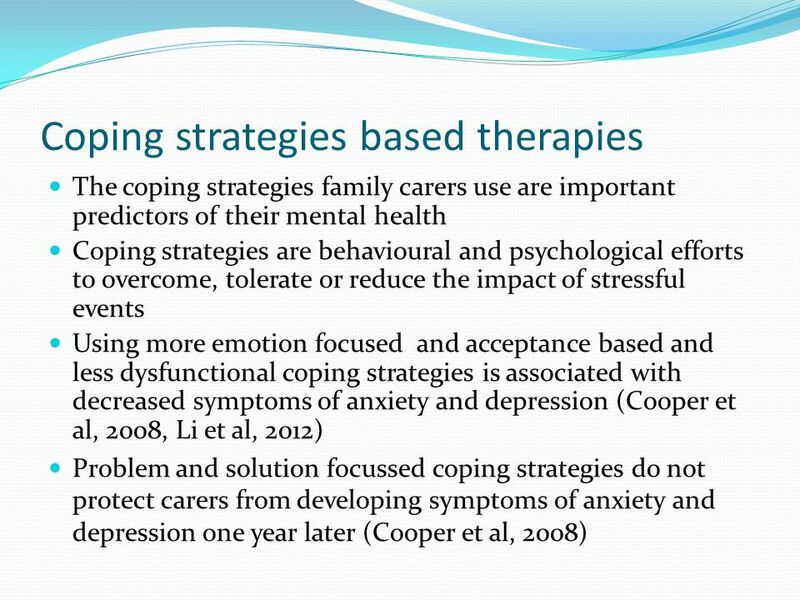 Good evidence that individual and group coping strategy based interventions are effective. 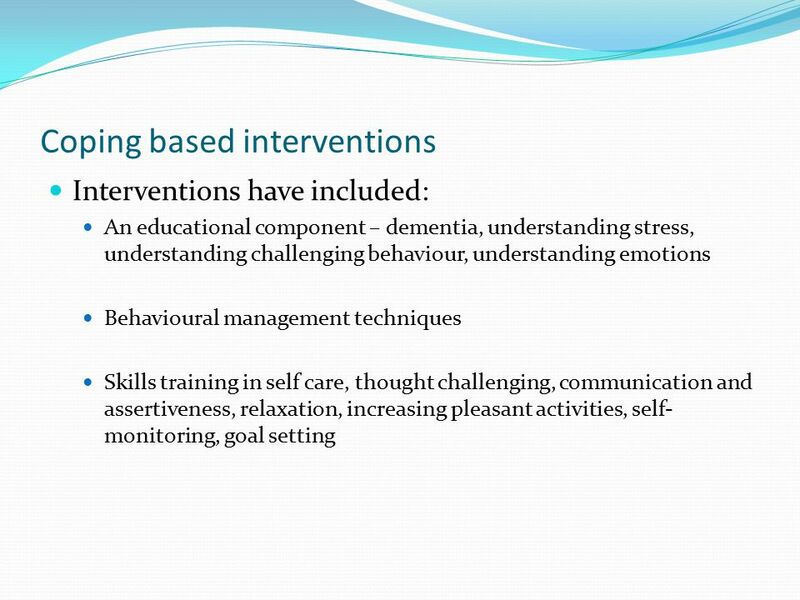 Group BMT interventions are not effective (Teaches techniques rather than focusses on specific behaviours) Education and supportive therapy alone were not effective. 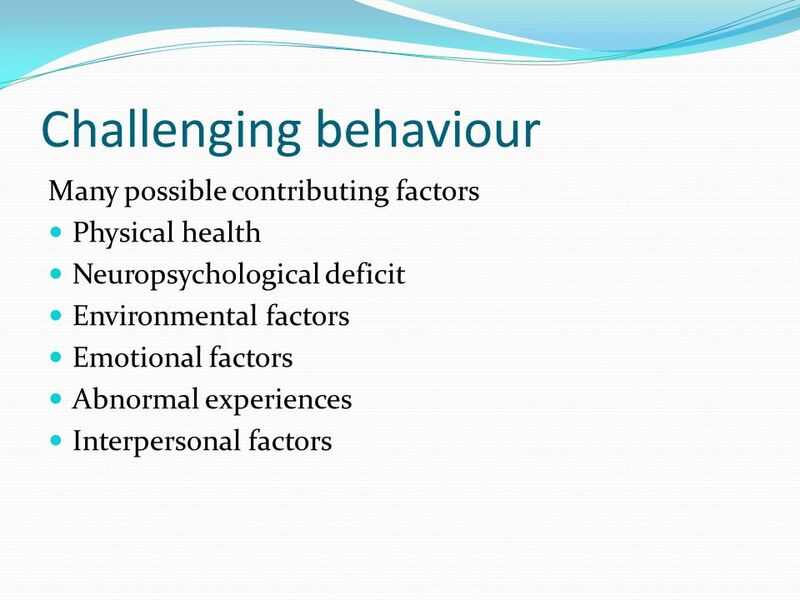 Group task: Functional analysis of behaviour which have found challenging in a work situation e.g. 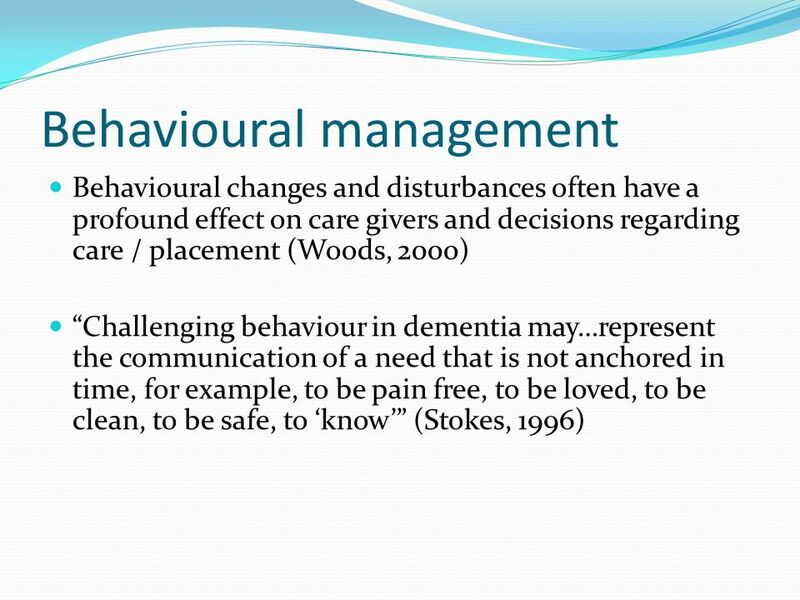 in care home / school (get into pairs and choose an example) (20 mins) Questions / prompts:- define behaviour difficulty possible explanations for why this is happening think about situations when these are more or less likely to happen (external & internal factors) solutions: what has helped & what may help in the future? 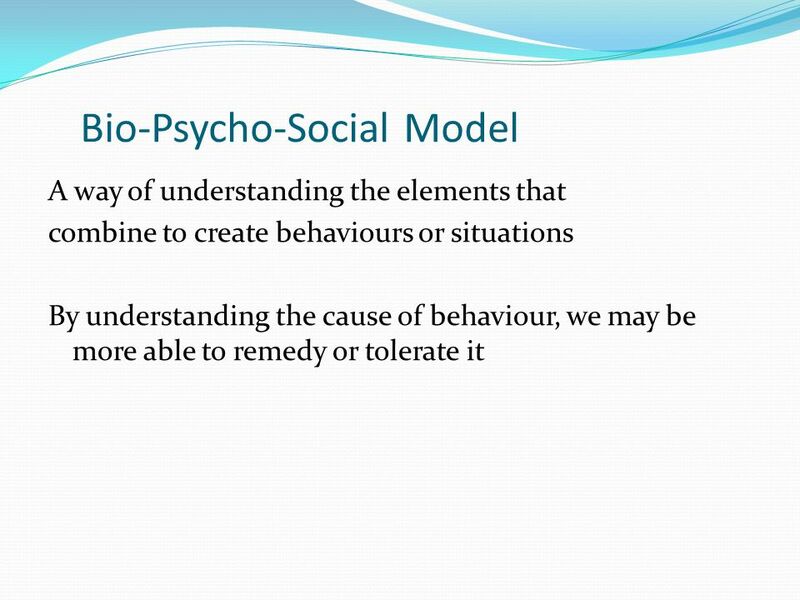 (make the situation more manageable / minimise distress on both parts) Reflect on feelings / responses may these behaviours evoke in loved ones? 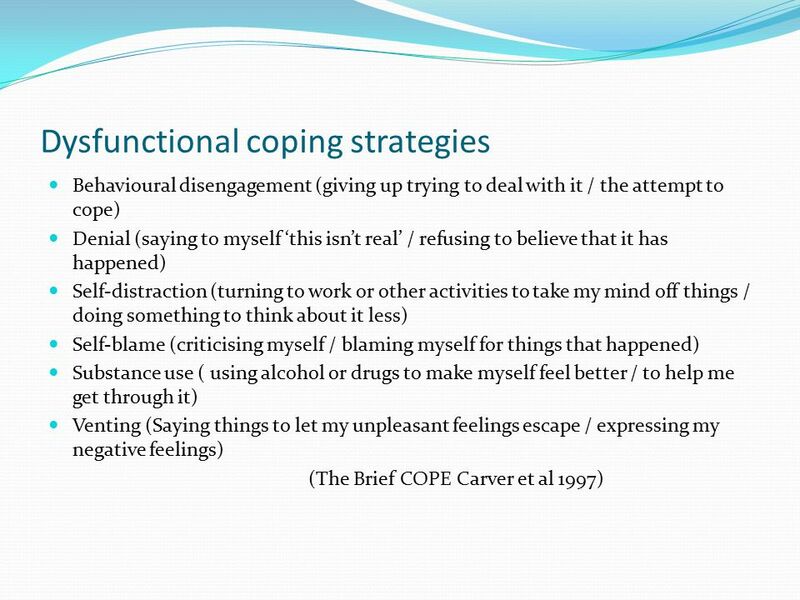 Coping strategies are behavioural and psychological efforts to overcome, tolerate or reduce the impact of stressful events Different ways we cope with challenges? 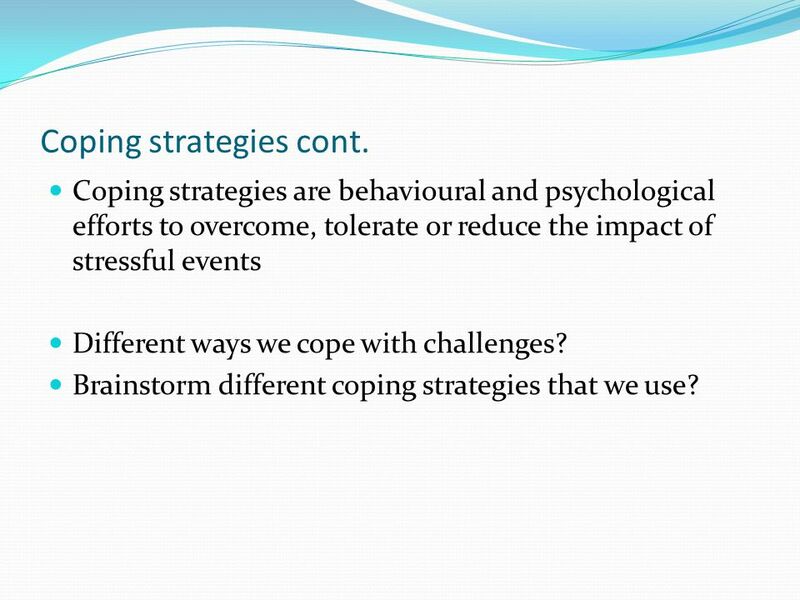 Brainstorm different coping strategies that we use? 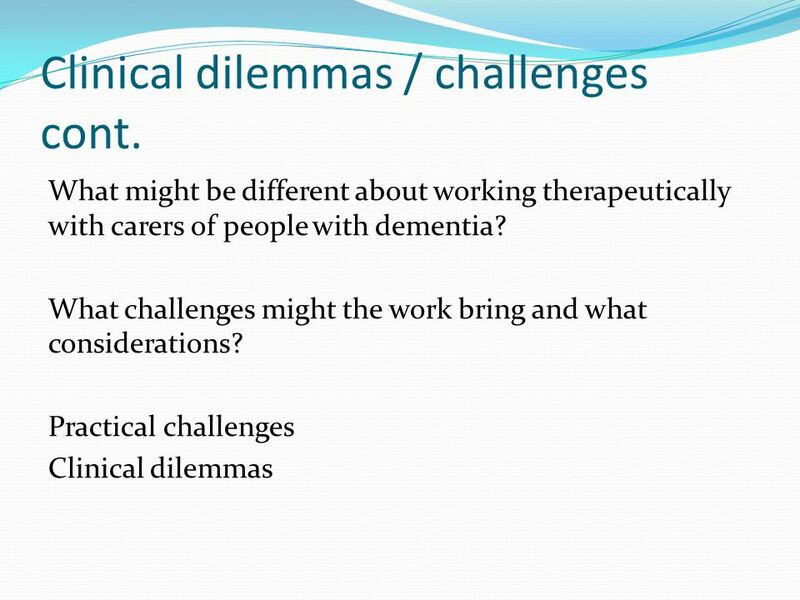 20 Clinical dilemmas / challenges cont. 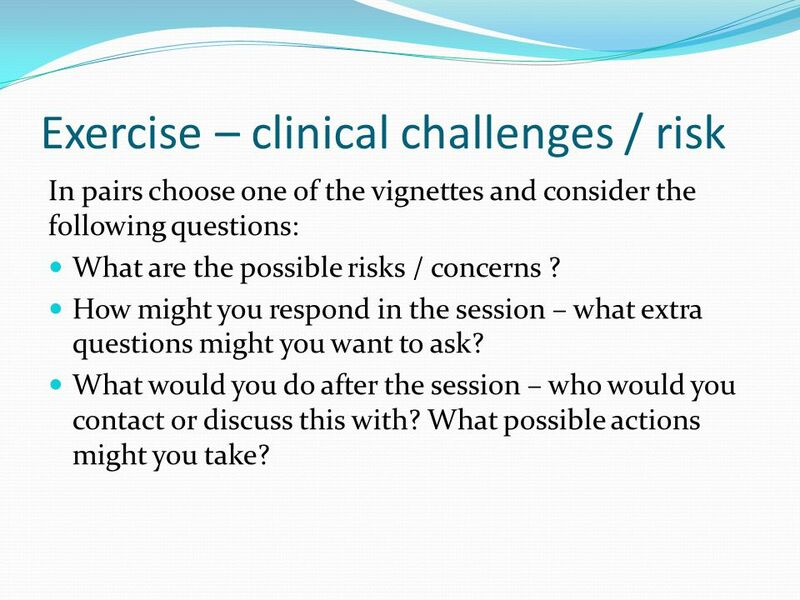 In pairs choose one of the vignettes and consider the following questions: What are the possible risks / concerns ? 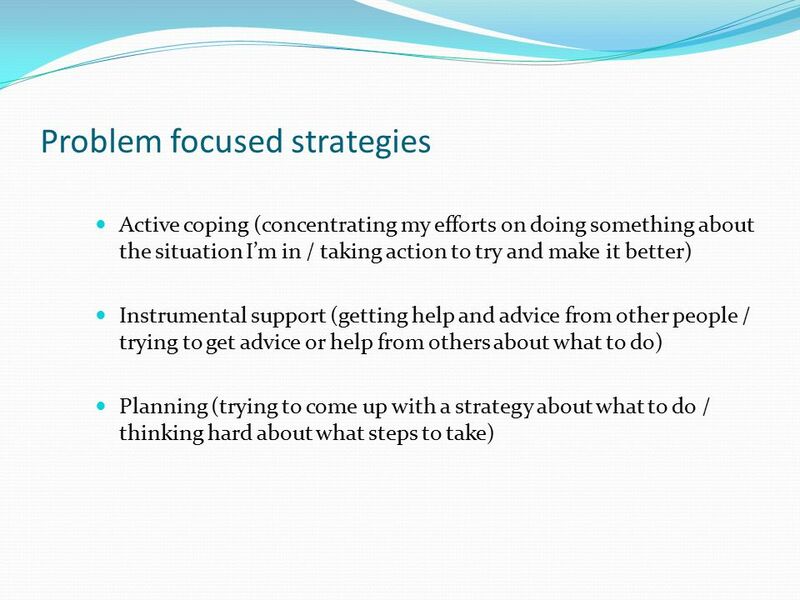 How might you respond in the session – what extra questions might you want to ask? 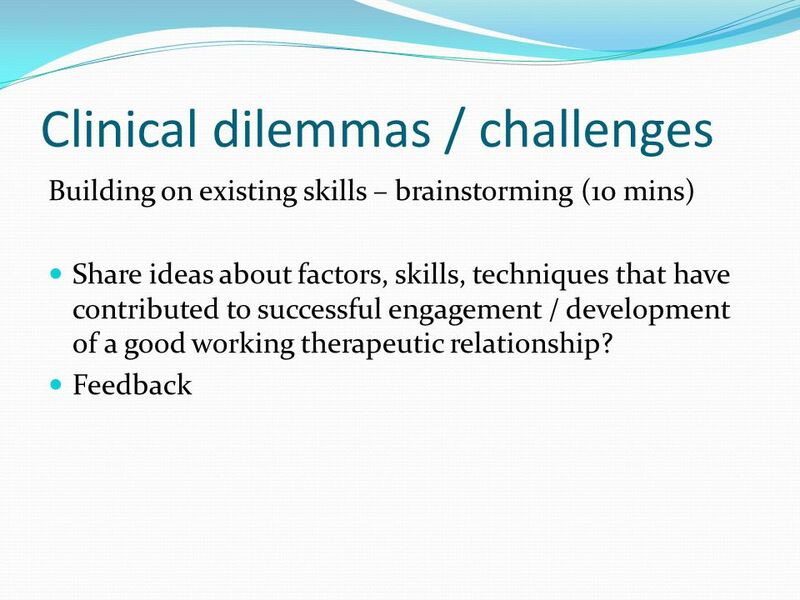 What would you do after the session – who would you contact or discuss this with? What possible actions might you take? 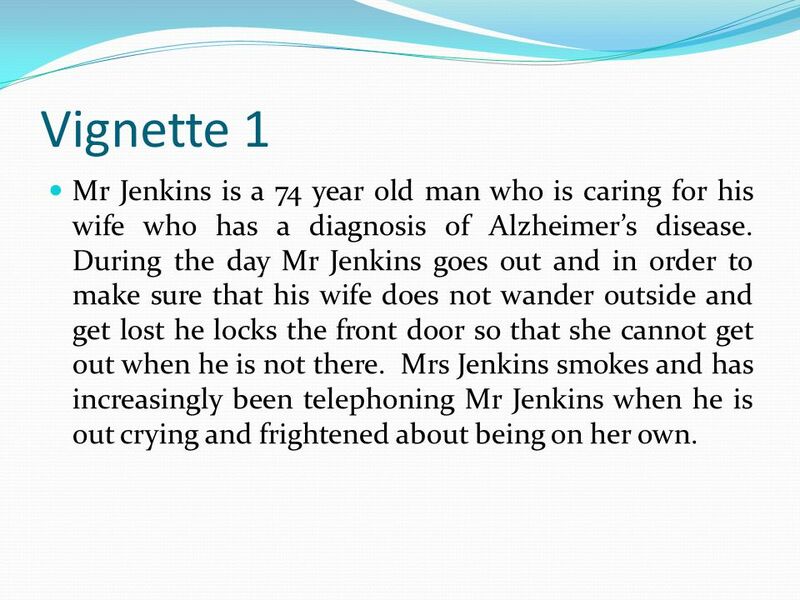 22 Vignette 1 Mr Jenkins is a 74 year old man who is caring for his wife who has a diagnosis of Alzheimer’s disease. During the day Mr Jenkins goes out and in order to make sure that his wife does not wander outside and get lost he locks the front door so that she cannot get out when he is not there. Mrs Jenkins smokes and has increasingly been telephoning Mr Jenkins when he is out crying and frightened about being on her own. 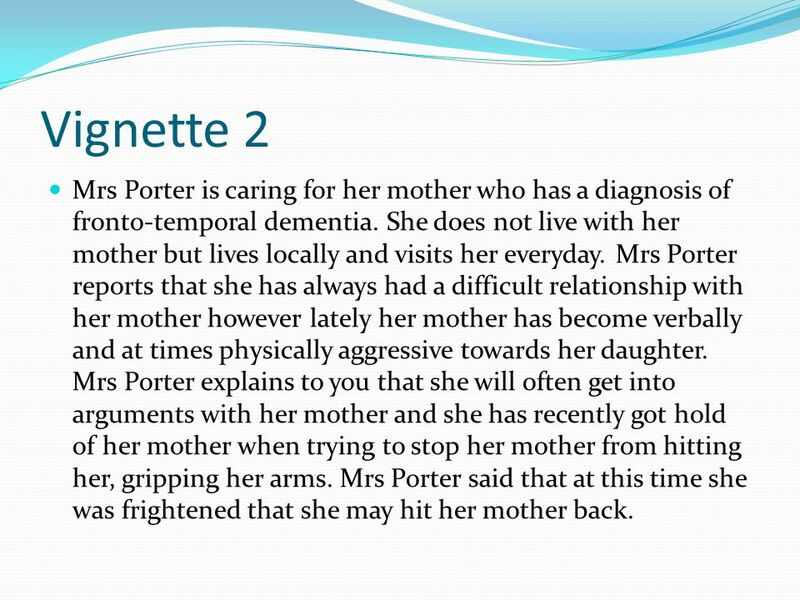 23 Vignette 2 Mrs Porter is caring for her mother who has a diagnosis of fronto-temporal dementia. She does not live with her mother but lives locally and visits her everyday. Mrs Porter reports that she has always had a difficult relationship with her mother however lately her mother has become verbally and at times physically aggressive towards her daughter. Mrs Porter explains to you that she will often get into arguments with her mother and she has recently got hold of her mother when trying to stop her mother from hitting her, gripping her arms. Mrs Porter said that at this time she was frightened that she may hit her mother back. 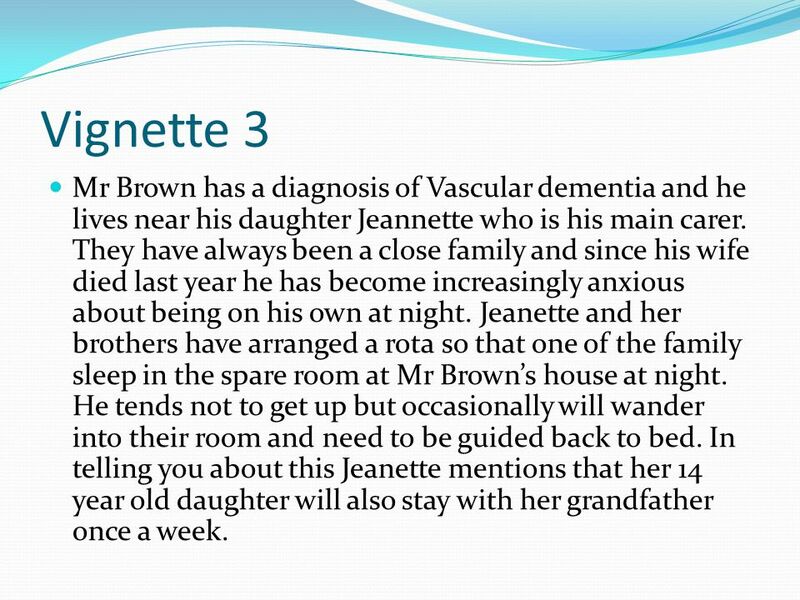 24 Vignette 3 Mr Brown has a diagnosis of Vascular dementia and he lives near his daughter Jeannette who is his main carer. They have always been a close family and since his wife died last year he has become increasingly anxious about being on his own at night. Jeanette and her brothers have arranged a rota so that one of the family sleep in the spare room at Mr Brown’s house at night. He tends not to get up but occasionally will wander into their room and need to be guided back to bed. In telling you about this Jeanette mentions that her 14 year old daughter will also stay with her grandfather once a week. 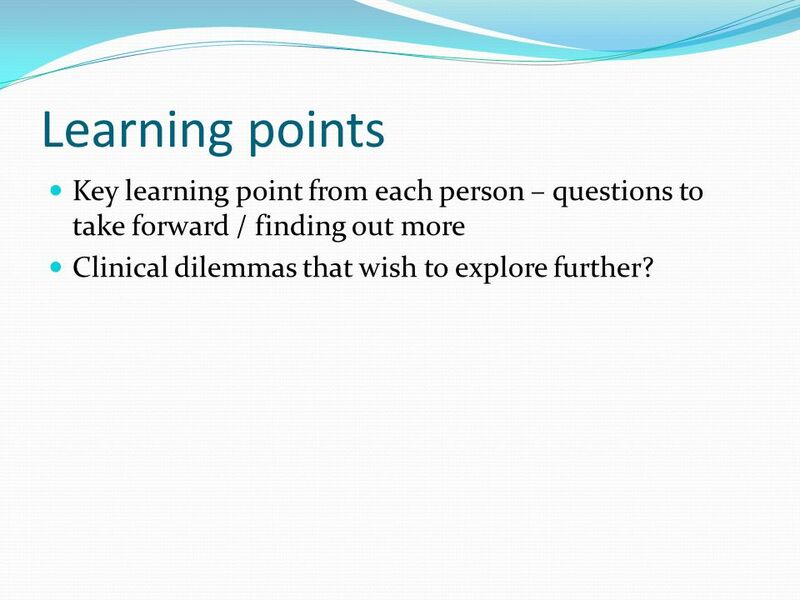 25 Learning points Key learning point from each person – questions to take forward / finding out more Clinical dilemmas that wish to explore further? 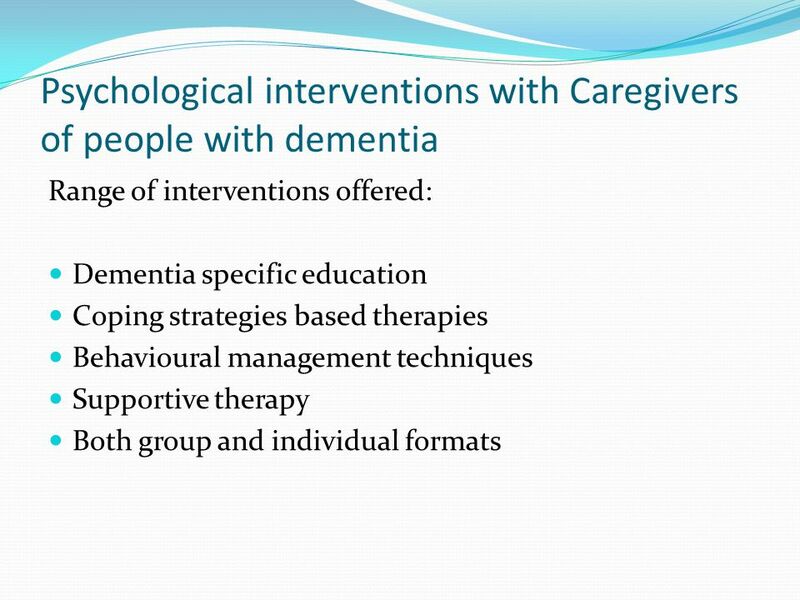 Download ppt "Psychological interventions with Caregivers of people with dementia"
Psychological Approaches in Primary Care Dr Andrew Wilson Bradford GP VTS. 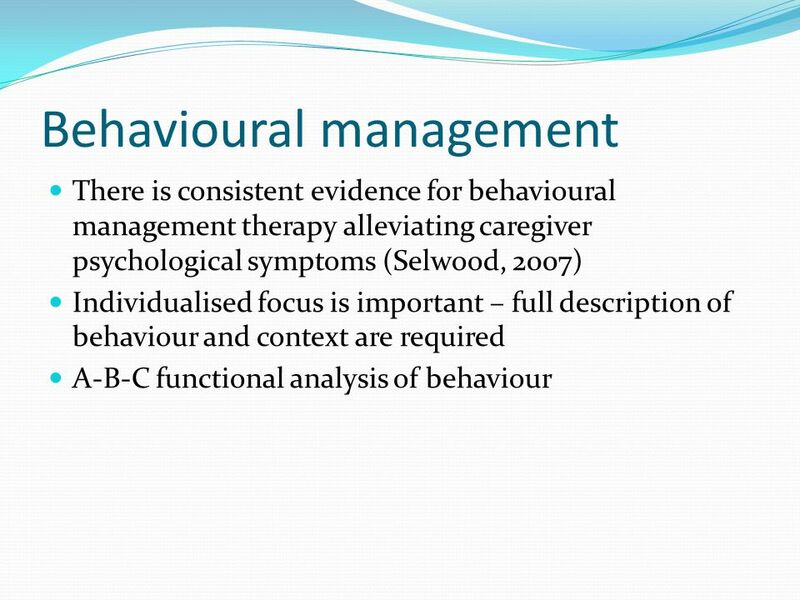 Introductory Training Behavioral Therapy Behavioral Therapy helps you weaken the connections between troublesome situations and your habitual reactions. Mental Illnesses Can happen to anyone, of any age, anywhere. 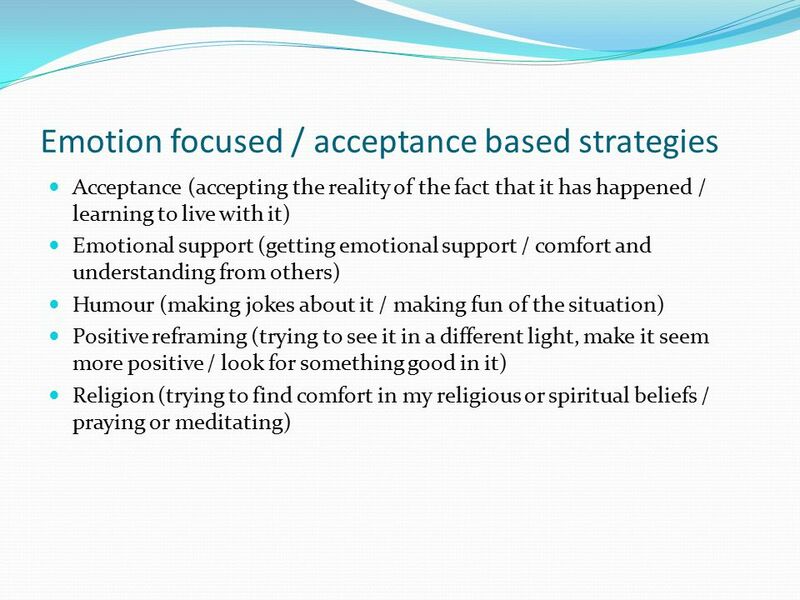 “Getting to Know Me” Supporting people with dementia in general hospitals Part 2: Seeing the whole person © University of Manchester/Greater Manchester. 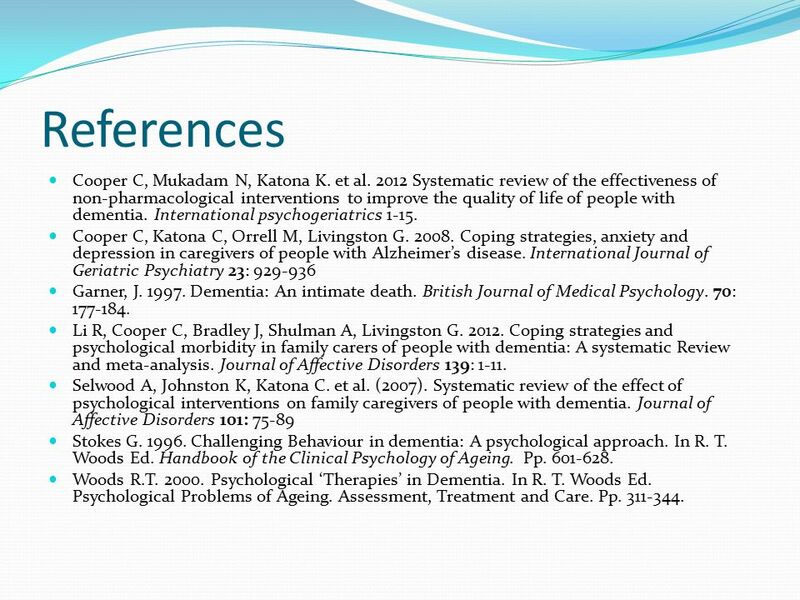 Facilitate support responsive to the specific nature of dementia CHCAC416A. Introduction to Motivational Approach Social Services Forum for First Nations of Quebec January 30, 2014 By Barbara Bouchard & Sophie Pelletier. 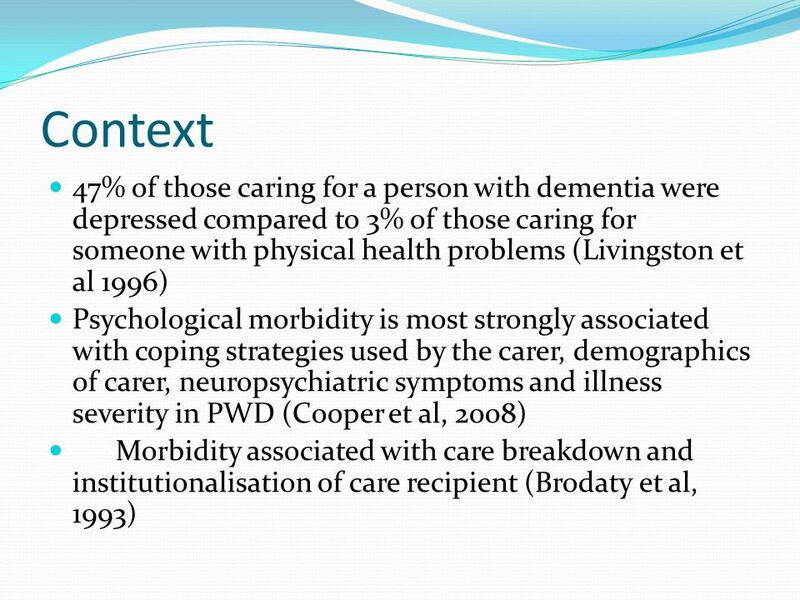 Carers & Mental Health  Tania Ewin, Senior Project Officer Partners in Depression A mental health initiative of….Program funded by…. 1. 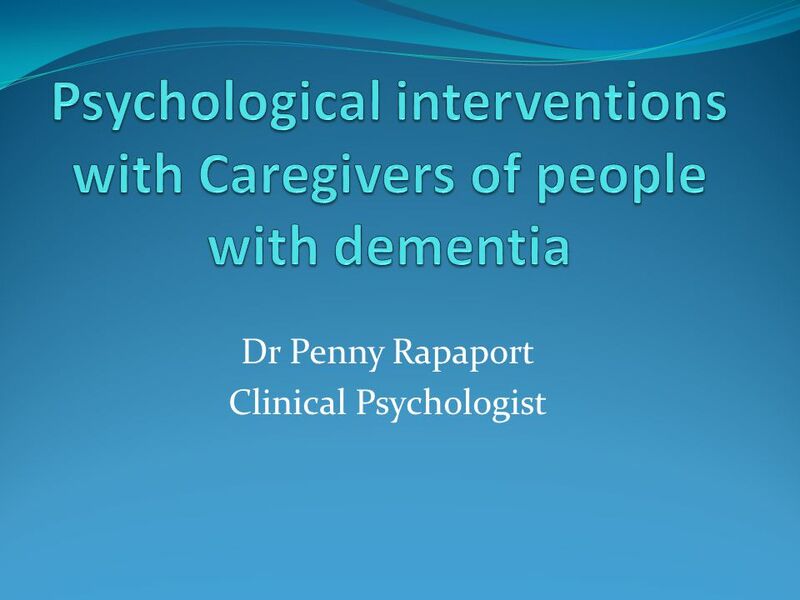 Division of Clinical Psychology Conference 2012 Working with Older Couples In IAPT By Dr Jonathan Hutchins Clinical Psychologist. Coping with Spinal Cord Injury. Spinal cord injury is often a huge shock that someone is not prepared for. Such a trauma can cause many feelings such.